If you ever have the privilege of sitting in a Preschool or Kindergarten classroom, you might see that some of the strongest advocates for equal rights are small children. Kids can spot unfairness a mile away. I dare you to pass out ice cream at a birthday party and leave someone out (speaking from experience)! While I have no clear explanation for my children and students about injustices, I can at least start by telling the stories. Below are five beautiful and honest books about the Civil Rights Movement. 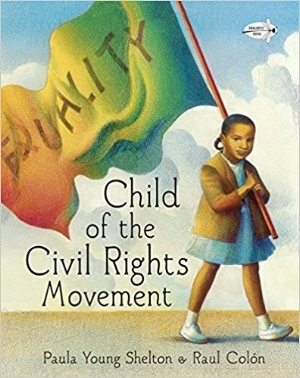 Child of the Civil Rights Movement by Paula Young Shelton, Illustrated by Raul Colon. Beautifully illustrated, this book is told from a child's perspective. The book tells the story of the march from Selma to Montgomery in 1965. It was also named as a book of the year by a comprehensive list put out by Bank Street College of Education. 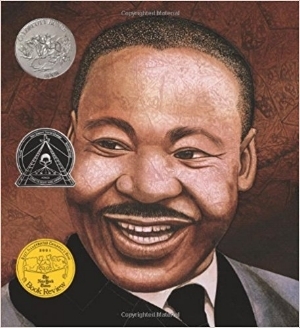 Martin's Big Words: The Life of Dr. Martin Luther King, Jr by Doreen Rappaport, Illustrated by Bryan Collier. A biography that incorporates quotes from MLK's speeches. This unforgettable story is accompanied with striking and bold pictures. The Youngest Marcher: The Story of Audrey Faye Hendricks, a Young Civil Rights Activist by Cynthia Levinson, Illustrated by Vanessa Brantley Newton. At the age of nine, Audrey became the youngest child to be arrested during a protest in 1963. She confidently and bravely stood up for civil rights. 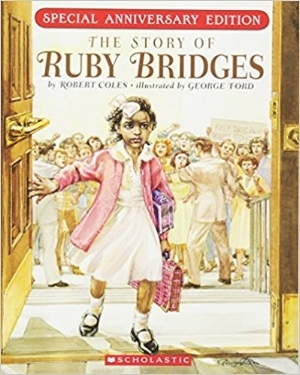 The Story of Ruby Bridges by Robert Coles and George Ford. Ruby was the first African American girl to desegregate an elementary school in New Orleans. I read this book several years in a row when teaching at an all-girls' school and it always sparked deep and moving conversations. Separate is Never Equal by Andrea Davis Pinkney and Brian Pinkney. The story is one of perseverance and determination, painting a true image of slow progress and social change. The book is about how one family ended school segregation in California, ten years after the passing of Brown vs. the Board of Education. This book is great for any age to enjoy with engaging illustrations and is the recipient of several awards such as the Robert F. Silbert Honor Book. It's Library Card Sign-up Month! Whether you are a librarian, teacher, parent or caregiver here are some ways that you can get kids involved! Have your children and students get their library card. Teachers, you can send home the forms and even help your kids fill them out in class. Then ask parents or caregivers to take their children to the library as a fun activity. After all, it's free! For each child's birthday, donate or dedicate a book to a library. There are many ways to do this without spending a lot of money. Teachers, you can receive book donations from stores, ask parents to donate a book or simply choose a book from the library that reminds you of the child and dedicate it to him or her with a letter in the front of the book. Have the librarian come to your classroom or take your child to the public library and ask him or her interesting questions. What's the longest book they have ever read or shelved? Why did they become a librarian? What do they think about ebooks? Even high school students love a good picture book if it's presented correctly. I remember reading The Velveteen Rabbit for the first time when I was sixteen. Students feel young and venerable again just as they should when reading a good book. Try it! You might be interested to see what you learn from them and about them. Parents, cozy up on the couch or take a book to the park or a blanket in the backyard. Teachers, if you have a free period or a silent reading period, have your students go to the library with comfy chairs and reading pallets to enjoy a book in a cozy environment. Bookstores and libraries want to help teachers! Call around and ask for swag to give your kids and students. Books of Wonder gave me tons of free totes bags they had left over from an event and some books. I was able to give the totes and books to students at Bronx Arts. It's amazing what providing some materials can do for a child's self-esteem and eagerness.